A method to accurately measure forces through the radius is necessary due to the complex loading of the elbow. It was hypothesized that a custom axial load measurement device may allow for the accurate quantification of these unknown forces. 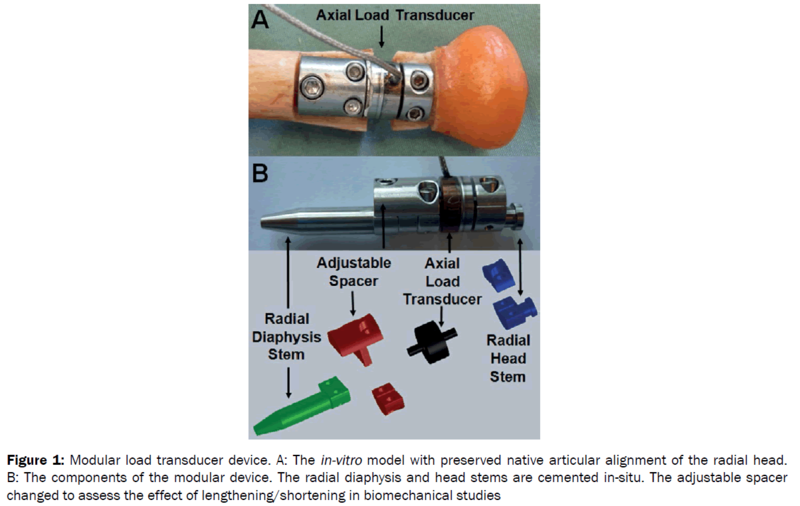 This work reports on the design and validation of an axial load transducer interposed in the diaphysis of a long bone that maintains the native articular location. The performance of the device in quantifying axial loads is evaluated in an in-vitro isolated proximal radius model. The model was validated by statically applying linearly increasing proximal radius loads on a servo-hydraulic testing frame mounted using a pivot support to nullify reaction moments. The direction of net applied load was varied to simulate multiple forearm positions and flexion/extension angles (10, 20, 30 and 40 degrees). There was no significant difference between axial transducer load and expected load (p<0.001). Axial transducer loads were in close agreement with expected loads in all forearm positions for forearm angles up to 30 degrees. The results validated the efficacy of the device in measuring osseous loading while maintaining the native articular location. Radiocapitellar joint, Load transducer, Radius, Elbow load sharing. Load-sharing between the radius and ulna can be altered by some orthopaedic procedures, as a result of implant placement during total elbow arthroplasty or replacement of the radial head with a prosthesis. Failure to restore the joint to its native condition has unknown consequences . In many clinical cases, length changes of the radius occur  and further alter loads through the articulation and soft tissues. This altered loading may increase the risk of cartilage wear and degenerative changes at the radiocapitellar and ulnohumeral articulations. As such, post-traumatic arthritis has been well-described and is a common complication of complex elbow injuries, even following appropriate bone and ligament repair . Isolating loads through the proximal radius is impossible without interposing a measurement device within the bone due to the redundant loading scenario imposed by soft-tissues and osseous contacts. Multiple studies have assessed elbow load sharing, and describe devices capable of measuring in-vitro radial and ulnar loads [2,4–9]; however these devices disrupt soft tissues, especially the annular ligament, which are significant contributors to the net load vector through the radial head. Such a device which does not disrupt soft tissues, or alter the articulation, has yet to be described. This study describes the validation of a custom axial load transducer implanted in the proximal radius. The device was tested in an in-vitro model with a servo-hydraulic testing frame to assess the devices accuracy in measuring a wide range of proximal radius loading vectors. The in-vitro model consisted of one fresh-frozen cadaveric radius (age: 62, male) and an interposed modular axial load transducer device (Figure 1). The device was custom manufactured to allow for stem fixation in the diaphysis and head of the radius. An adjustable spacer was included as part of the design to allow for the effect of radial length changes on radial loads to be measured in subsequent cadaveric biomechanical studies. The device uses a commercially available axial load transducer (Subminiature Model 11, Honeywell, Morristown, NJ, USA) and the modular design allows for installation while maintaining a bone bridge to preserve the native radial head articular location. The surgical procedure consisted of first opening a cortical window in the radial neck to expose the intermedullary canal. Bone cement was then placed in the diaphysis and radial head and the respective stems were placed, and the load cell was assembled in-situ, prior to cement hardening. At this time a section of the radial neck remained, termed the ‘bone-bridge,’ in order to preserve the native radial head articular location. The proximal radius osteotomy was completed after the cement hardened by removing the bone-bridge. The radius was than excised from the forearm and denuded of all soft-tissue. The radius model was rigidly mounted for digitization of bony landmarks using an optical tracking system (Optotrak Certus, NDI, Waterloo, CA). These landmarks were used to derive an anatomical coordinate system about the long axis of the radius. This coordinate system allowed for theoretical loads to be calculated as a function of position under loading with a servo-hydraulic testing frame (Instron 8501, Norwood, MA, USA). Additionally, digitization of the implanted device within the radius model allowed for the theoretical loads to be adjusted accounting for the load transducer axis offset. Implant angles were 3.61° in the anteriorposterior and 3.50° in the medial-lateral planes relative to the anatomical long axis. The radius was cemented in an ABS tube with the proximal radius protruding and secured on a custom jig mounted to an X-Y stage. This jig allowed for simulated flexion and extension angles of the model. The native capitellum diameter was simulated using a metal hemisphere mounted to the servo-hydraulic actuator. The base of the ABS tube pivoted on a smooth spherical bearing which was aligned with the digitized long axis of the radius. This pivot support nullified reaction moments, allowing for comparison with theoretical axial loads. Static loads were applied from 20 to 100 N at 20 N increments at angles of 10, 20, 30 and 40° to the long axis in the anterior-posterior and medial-lateral planes. Axial load transducer values were collected using custom software (National Instruments, Austin TX, USA). Mean error and standard deviation at each angle and forearm position was calculated to assess the accuracy of the axial load transducer. A two-way mixed intra-class correlation (ICC) with absolute agreement was used to determine the difference between measured transducer and expected loads. The transducer loads were in very close agreement with the expected loads (Table 1), and transducer error was linear in response to linearly increasing applied loads for all positions (R2 ≥ 0.82) (Figure 2). Load transducer errors were less than 6 N for off-axis angles up to 30°. Largest transducer errors occurred at 40° in the medial and anterior positions (Figure 2). There was no significant difference between transducer load and expected load (p < 0.001) at each applied load for each of the four forearm positions. Intra-class correlations with absolute agreement were ≥ 0.991 for all angles and positions measured (Table 1). Figure 2: Measured axial load transducer errors when compared to theoretically calculated loads as a function of applied load, at four angles and four simulated forearm positions. Theoretical loads were calculated by adding or subtracting the flexion/extension angle and implant angles for each respective forearm position. 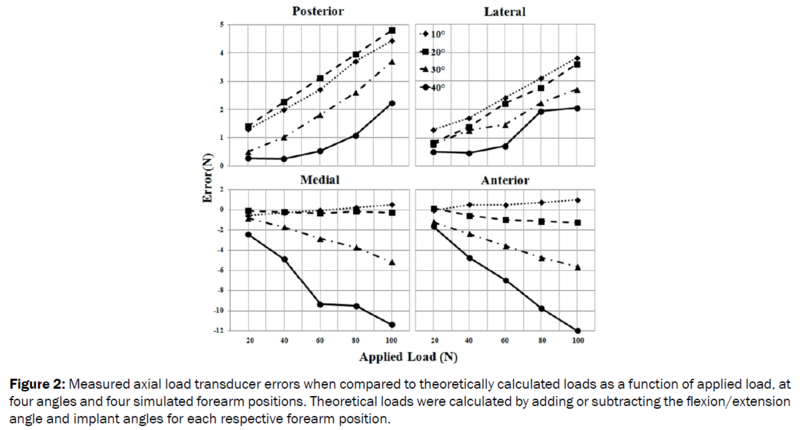 Table 1:Intra-class correlations (ICC) between measured transducer loads and theoretical loads for four forearm positions at four forearm angles, all were significantly correlated (p < 0.001). The results of this study validate the device’s ability to accurately quantify loading of the proximal radius. Correlating transducer and expected loads at all angles in each of the four forearm positions, it was found that there was no significant difference between transducer and theoretical loads for linearly applied static loads. It is important to keep in mind that the range of angles tested does not represent the joint range, but rather a range of loading vectors due to articular contact and soft tissue supports. This does not suggest that possible load vectors can be this extreme. As such, this validation shows that this device can accurately represent a wide cone range of internally generated net loads. The medial and anterior loading directions are perpendicular, and as such the increased error in these positions cannot be explained by reduced implant fixation or stiffness of the overall construct. In accounting for misalignment of the load cell measurement axis with the radius long axis, it was noted that the load cell was positively misaligned in these directions. Although this misalignment was accounted for, and was constant throughout testing, it may interact with the load cell’s off-axis measurement error to produce a non-linear response. The device can be used to measure proximal radius loading in biomechanical studies. Its modular design allows assessment of length-changing osteotomies, and its compactness provides for minimal soft-tissue disruption, including the annular ligament. Additionally, it allows preservation of the native articular alignment. This study provides a validated in-vitro proximal radius model to be used in biomechanical studies. Additionally this model allows for the validation of loading of the proximal radius in computational models. Maintaining the native articulations using the bone bridge technique ensures physiologic loads are measured. The modular design allows for lengthening and shortening of the radius, which can be a useful tool in measuring changes due to radial head implants and surgical procedures. With minor modifications the implant’s modular design, in conjunction with the bone bridge technique, is useful for measuring axial loads in any long bone segment. Shaaban H et al. The load-bearing characteristics of the forearm: pattern of axial and bending force transmitted through ulna and radius. J. Hand Surg. Br. (2006);31:274–279. Markolf KL. et al. Radioulnar Load-Sharing in the Forearm. J. Bone Jt. Surg. (1998);80:879–888. Ring D et al. Posterior dislocation of the elbow with fractures of the radial head and coronoid. J. Bone Jt. Surg. (2002);84:547–551. Palmer AK et al. Biomechanics of the Distal Radioulnar Joint. Clin.Orthop.Relat. Res. (1984);187:26-35. Ekenstam F. The load on the radius and ulna in different positions of the wrist and forearm: a cadaver study. ActaOrthop. (1984);55:363–365. Trumble T and Glisson R. Forearm force transmission after surgical treatment of distal radio ulnar joint disorders. J. Hand Surg. Am. (1987);12:196–202. Rabinowitz R and Light T. The role of the interosseous membrane and triangular fibrocartilage complex in forearm stability. J. Hand Surg. Am. (1994);19:385–393. Pfaeffle HJ and Fischer K.A new methodology to measure load transfer through the forearm using multiple universal force sensors. J. Biomech. (1999);32:1331–1335. Palmer A and Werner F. The triangular fibrocartilage complex of the wrist—anatomy and function. J. Hand Surg. Am. (1981);6:153–162.